Hosted at DD's Studio, Mountain Creek. We discuss your hearts desire ahead of time to come up with the essence or theme you would love to paint with me. or wild and free, and you paint from your Gypsy Soul. Live demonstration of the painting with tuition and assistance as desired. three friends came together, such a treat. "Divinely Feminine, and thoroughly enjoyable." Tailored to suit your desired theme, essence. Student painting in one day : Demo painting same day. ​I invite you into an environment of nurturance and self compassion. I love to work with you to awaken your inner wise woman. I find painting is a beautiful, sometimes challenging and confronting self healing practice. 'it's only paint' so you can let yourself play, and be open to what wants to happen. My relationship to Mary is one of some reverence, but also of quite a distance. I have been estranged from the Catholic faith since about age 15 or earlier. But it was with some small excitement that I listened to author Clarissa Pinkola Estes (Women Who Run With The Wolves) in a talk say the words “You know, Mary wasn’t a Catholic” - meaning.. she doesn’t just belong to those of the Catholic faith.. and this small statement opened up a window for me that I had put some pretty heavy drapes across. What I love about her and the images of her I have grown up seeing all of my life has now come to remind me instantly of my Mother. Early in 2016 I had the honour of being with my Mother for her last days on earth and seeing the grace and peace that held her and being immersed in the incredible energy of that with her was a life changing experience.. So much love and respect to the Mothers of us all. I know she is in a beautiful place now and continues to be a beautiful support and encourager of this creative life I share with you all. 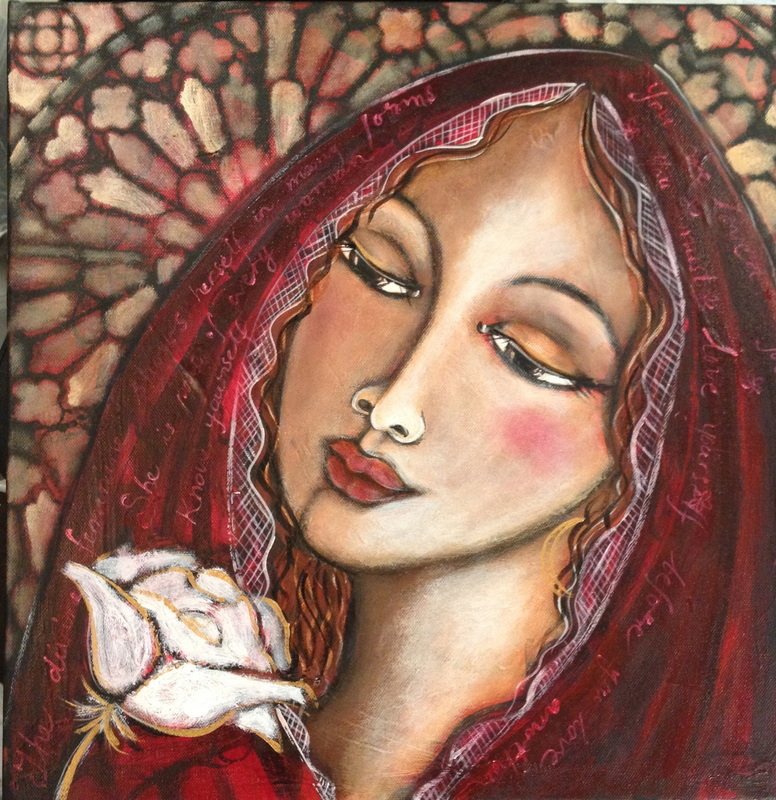 I would be honored if you would like to journey with me and create your own version of a Mary, or Madonna, Goddess. She may take on whichever nuance you deem her to have for you. in a blog post called ​"Mary, Mary, I'm Contrary".